Pluto in Cancer in 7th house. Don't smother each other. No one can grow in shade. Pisces Moon trine Saturn in Scorpio in 11th house? Pluto in 7th house opposition Mars in 2nd house. 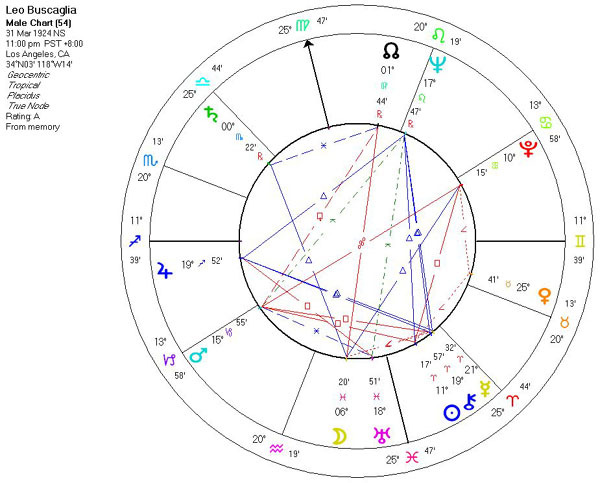 Grand trine Neptune – Jupiter – Chiron/Mercury in fire signs. Chiron conjunct Mercury in Aries. A total immersion in life offers the best classroom for learning to love. One does not fall 'in' or 'out' of love. One grows in love. A wife says to her husband (or vice versa), "Do you love me?" "Of course," he replies. "I've been married to you for twenty years, haven't I?" How satisfied would we be if we presented someone with a vintage wine and, asking his opinion of it, he replied, "I'm drinking it, aren't I?" Love still needs expression between those who share it. To laugh is to risk appearing the fool. To weep is to risk being called sentimental. To reach out to another is to risk involvement. To expose feelings is to risk exposing your true self. To place your ideas, your dreams before the crowd is to risk being called naive. To love is to risk not being loved in return. To live is to risk dying. To hope is to risk despair, and to try is to risk failure. But risks must be taken because the greatest hazard in life is to risk nothing. The person who risks nothing does nothing, has nothing, and becomes nothing. He may avoid suffering and sorrow, but he simply cannot learn and feel and change and grow and love and live. Chained by his certitudes, he is a slave, he's forfeited his freedom. Only the person who risks is truly free. We need others. We need others to love and we need to be loved by them. There is no doubt that without it, we too, like the infant left alone, would cease to grow, cease to develop, choose madness and even death. It's not enough to have lived. We should be determined to live for something. May I suggest that it be creating joy for others, sharing what we have for the betterment of personkind, bringing hope to the lost and love to the lonely. Sagittarius Ascendant. As soon as the love relationship does not lead me to me, as soon as I in a love relationship do not lead another person to himself, this love, even if it seems to be the most secure and ecstatic attachment I have ever experienced, is not true love. For real love is dedicated to continual becoming. A wonderful realization will be the day you realize that you are unique in all the world. There is nothing that is an accident. You are a special combination for a purpose-and don't let them tell you otherwise, even if they tell you that purpose is an illusion. (Live an illusion if you have to). You are that combination so that you can do what is essential for you to do. Don't ever believe that you have nothing to contribute. The world is an incredible unfulfilled tapestry. And only you can fulfill that tiny space that is yours. Leo Buscaglia was born March 31, 1924. He was the son of Italian immigrants, and didn’t learn to speak English until he entered primary school in Los Angeles. His teachers mistook his fumbling language skills for mental retardation and placed him in a special education class. Under the wing of a caring teacher, he learned English and a lesson in compassion that would eventually lead him into a career as a speech therapist in Los Angeles-area public schools. Buscaglia served as supervisor of special education in Pasadena City Schools from 1960 to 1965. He then joined the USC (University of Southern California) School of Education faculty and taught special education and counseling at the university until 1984. After retiring from teaching, he served on the School of Education’s Board of Councilors. In 1989, Buscaglia gave real estate valued at $500,000 to USC. Known as "Dr Hug," he shook up the University of Southern California in the 1970s when he started classes on love, including "Love 101," combining sociology and psychology. His first book, "Love," came out in 1972 and examined the phenomenon of human love as the one unifying force in life. 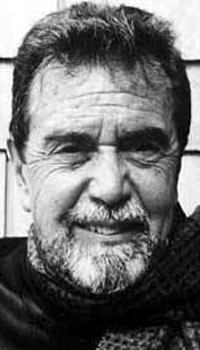 Leo Buscaglia earned a bachelor’s degree in English and speech (1950), a master’s degree in language and speech pathology (1954) and a PhD in language and speech pathology (1963) from USC. In 1969, he taught a self-actualization course at USC. Love 1A begat Love, the first in a long series of Buscaglia best-sellers, including Personhood, Loving Each Other and Fall of Freddie the Leaf. He wrote more than a dozen books and sold more than 11 million copies in 20 languages. Among them were "Loving Each Other" and "Living, Loving, and Learning." At one time, five of his books appeared on The New York Times best-seller list. His most recent book was "Love Cookbook" in 1994. 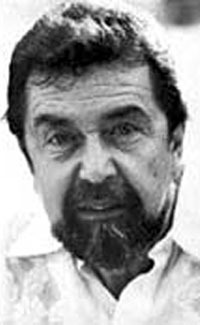 Sadly, Leo Buscaglia died of a heart attack on June 11, 1998 at his home in Glenbrook, Nevada, near Lake Tahoe. He was 74. He will be missed by many, many people. Dr. Felice Leonardo Buscaglia Ph.D. (31 March 1924 - 11 June 1998) was a professor of Italian descent at the University of Southern California, who authored a number of New York Times bestselling inspirational books on of love and human reticences on the subject, including The Fall of Freddie the Leaf, Bus 9 to Paradise, Living Loving and Learning, and Love. In lectures he often protested, in outrage at the comparative absence of writings on the subject, "I got the copyright for love!!!" While teaching at the USC, Buscaglia was moved by a student's suicide to contemplate human disconnectedness and the meaning of life, and began a non-credit class he called Love 1A. His book and numerous recorded and televised lectures, some of which became available through PBS, and which became extremely well received. He argued that social bonds are essential at transcending the stresses of everyday life and enriching it above the limitations of poverty as well as crossing communication gaps between generations. 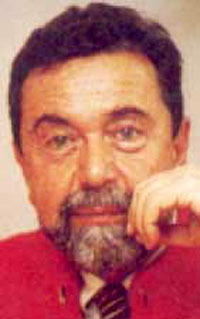 Buscaglia worked actively to overcome social and mental barriers that inhibited the expression of love between people, from family to acquaintances to the disabled, institutionalized, and elderly, to complete strangers, often making his own forwardness on the subject a topic of self-deprecating humor. The profundity of his subject, however, almost invariably struck a responsive chord regarding an area many regarded as deficient in their lives, and by 1998 his books had reached eighteen million copies in print in seventeen languages. 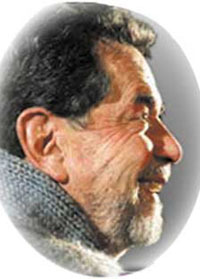 Tragically, Leo Buscaglia died of a heart attack on June 11, 1998 at his home in Glenbrook, Nevada, near Lake Tahoe. He was 74. Born in Los Angeles, Felice Leonardo Buscaglia (he later inverted the initials) was the youngest of four children of Italian immigrants. He was raised Roman Catholic, and was influenced by Buddhism in his adult life. The combination of physically demonstrative love of life learned from his Mediterranean parents combined with the inner reflection learned from travels and studies in Asia served him well. His childhood is well known to his listeners and readers; it provided many fable-like experiences that he shared throughout his work. Readers from many diverse cultures identified with these stories, being reminded of elements of their own upbringing. So many letters to him started similar to this: "Dear Leo, I hope I can call you that rather than Dr. Buscaglia because I feel as if I know you, as if we are friends." His "Mama stories" continue to be quoted by fans. [When someone would identify themselves to him as a "fan," he would invariably reply, "Don't be a fan. Fans are fickle and will soon drop you for something else. Be a friend. You can count on friends.") While other children were playing chase games, little Leo was playing school, always casting himself as the teacher, and always with willing pupils. He served in the U.S. Navy in World War II. The slender young sailor did not see combat, but he certainly saw its aftermath in his duties in the dental section of the military hospital, helping to reconstruct shattered faces. Using the benefits of the G. I. Bill, he was able to go to the private University of Southern California after the war. His association with USC is somewhat unique in the academic world. He received his bachelor's, master's and doctorate degrees there, and later became a faculty member. Upon his retirement, the university president named Buscaglia Professor at Large, an honorary title held by only one other person at that time. His non-credit Love 1A class was right for the times when it began in the late 1960s. He prepared a talk for educational conferences based on these sessions, which he wanted to call simply "Love". 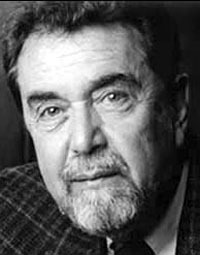 The reaction to both his dynamic, evangelical delivery and the content was like nothing ever seen in educational circles, and Buscaglia became a popular educational conference presenter. This exposure led to speaking requests by colleges, and by other professional and business organizations. Once these heartfelt talks were seen on national television they became the largest single money generators for PBS through much of the 1980s. While these presentations paved the way for many motivational speakers on PBS after him, Buscaglia never considered himself one of them. He was simply a teacher whose classroom had become the world. Over eleven million copies of his books had been purchased in the U.S. by the time of his death by heart attack in 1998. Approximately 24 editions are available throughout the world. He was very pleased and surprised by the strong sales in Italy. He never imagined Italians would need an American to remind them of the importance of food, family, sharing and love of life, because he had learned these things from his Italian parents. The study of love brought him to the study of life. "To live in love is to live in life, and to live in life is to live in love." But this should never be done passively. He wrote, "It's not enough to have lived. We should determine to live for something. May I suggest that it be creating joy for others, sharing what we have for the betterment of personkind, bringing hope to the lost and love to the lonely." Only you will be able to discover, realize, develop and actualize your uniqueness. And when you do, it's your duty to then "give it away."